SATURDAY APRIL 13 1963. Sutton United had just trounced Hitchin Town 4-0 in the semi-final of the FA Amateur Cup. As the victors walked off, the vanquished stood and applauded their opponents. Bruce Spavins, Hitchin’s skipper, led his team in acknowledging Sutton’ achievement. 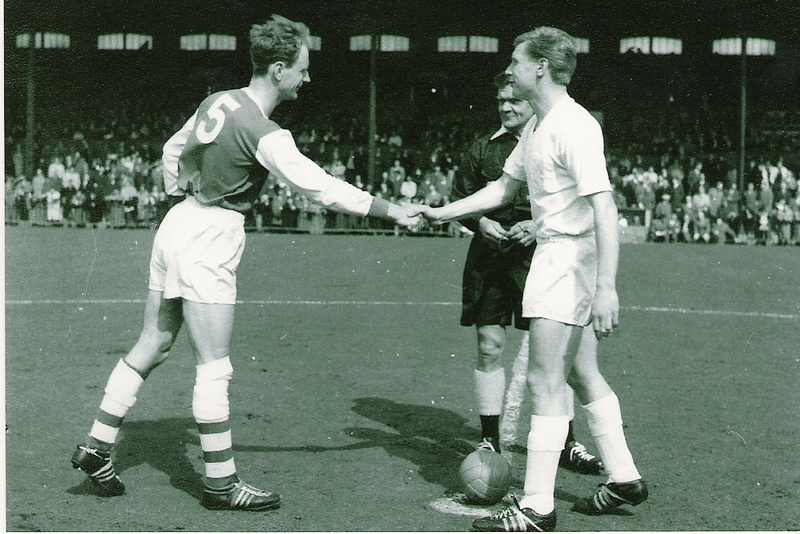 It was a different age, and Bruce Spavins epitomised the ideals of the age – the Corinthian spirit if you like. Spavins represented an era that would shortly come to an end. Competitive, without a doubt – he always said, “whatever the game, I play to win”, while also displaying a high degree of sportsmanship. Spavins, who died over the Christmas period, was one of the rocks on which Laurie Scott built a Hitchin team that flirted with major success. The side that reached two FA Amateur Cup semi-finals will always be considered one of the club’s greatest and Spavins was the captain and one of the key players in the heart of the team. 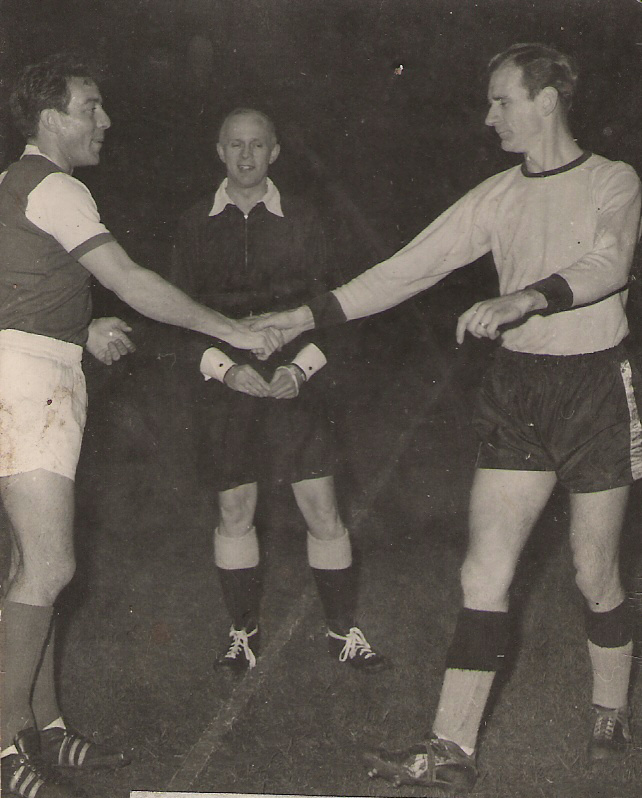 He joined the club from Luton Amateurs in the 1953-54 season and made his debut on March 27 1954 against Hendon. 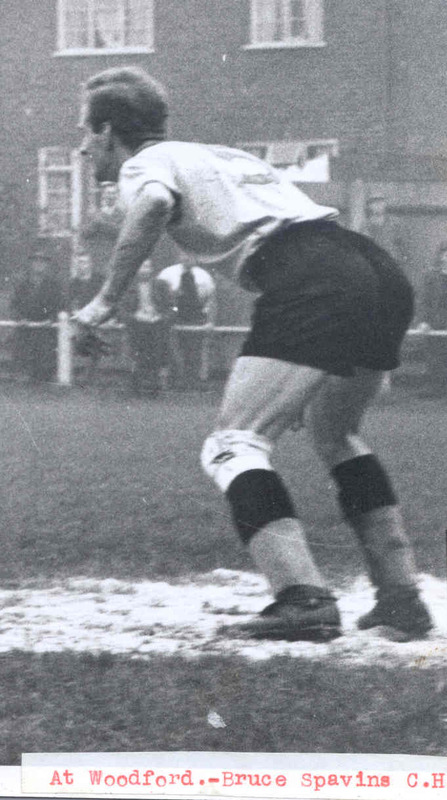 But it wasn’t until Scott came on the scene that Spavins became a regular and it stayed that way until he was force to retire through ill health in the club’s first Isthmian League campaign in 1963-64. Many felt that Spavins was unlucky not to have won an England international cap, such was his consistency across many seasons. He played almost 250 games for Hitchin Town, but never scored a single goal. But it was not just his ability that won Bruce Spavins many friends. Most people who came across him recognised his exemplary attitude. I took Bruce and his wife, Mavis, to see the work in the shaky old boardroom at top end of the ground. They sighed and were clearly moved by seeing this slice of club history. It was quite an emotional moment. People have described Bruce as a great clubman, a sportsman, “one helluva player” and a steady influence on the team. One might suggest he was also Hitchin Town’s greatest ever captain. “Simply a nice guy and an outstanding defender,” was how team-mate Dennis Randall described him. Bruce Spavins left an impression on many people and his passing is another reminder that the age of the gifted amateur has long gone. A very fitting tribute Neil. Nice article. You are very welcome, Jacky. I met Bruce a couple of times and spoke with him on the telephone. A real gentleman. Could I be more proud of my wonderful husband? Mave, I am so glad your family like the tribute. When I was involved in the club, for 20-odd years, I always said the best thing I ever did was bring together the 1961 team. One of the nicest things about that was meeting people like Bruce. My best wishes to you and your family at this difficult time. Bruce will never be forgotten at Hitchin Town! Thank you Neil for such a fantastic tribute to our Dad. As a family we have always been proud of his football achievements but it is nice to see that others thought a lot of him as well. My wife Erica died last year too. Bruce was her favourite cousin and she would talk endlessly about Bruce when they were youngsters. Our family were so proud of Bruce and one year we followed Hitchin in the Amateur Cup remembering one particular match against Leatherhead with snow piled up around the touchline. The world is a sadder place without them. Bruce is my brother. Thank you for the great memories that your article brought back for me of his younger days when he also played for Luton schoolboys, Bedfordshire Schoolboys and England schoolboys and England under 23’s. I am really proud that I had him for a brother as he was a great roll model and will be greatly missed by the family. Rest in peace Bruce. Thank you Neil for the lovely tribute to my dear brother Bruce. I am his youngest brother and feel very proud and privileged to have had Bruce as my brother. He was a great role model and will be sadly missed but will always be in our hearts and thoughts.